In India, a salwar suit is the next popular ethnic dress for women, after saree. The fashion of salwar suits originated from the Northern States of Punjab, Haryana and Himachal Pradesh. Over a period of time, the popularity of this garment has spread all over the nation. Though a salwar suit is marked as one of the most comfortable Indian dresses, it has lost its charm in the fashion trend. Many women think twice before shopping a salwar suit considering it a ‘boring’ outfit for special occasions. To end the struggle of such lovely ladies, TheHLabel has added a new definition to the salwar suits and brings 3 latest styles every woman must try! Be it parties or festivals, these new styles make a perfect pick for all occasions. The gharara style is a style inspired by Lucknow. This style was initially adopted by the Nizams. Now, it is popular among the commons people. The gharara style draws its charm from its pants, which are wide-legged and ruched at the knee. The gharara style by theHlabel is a perfect blend of fashion & culture. Made from chanderi & natural crepe fabrics, this gharara salwar suit draws its beauty from the floral embroidery on its kurta & pants. Inspired by one of the most popular ethnic garment of Indian men, the dhoti style is now trending as a popular fashion for ladies. Today, both Kurtis and pants are being created in a dhoti style. This dhoti kurta in pink ombre is a style you may have never seen before. This dress is a combination of rich fabrics like raw silk, chiffon, semi saw silk & georgette. It is a must buy if you love beautiful embroidery & want an appealing ombre look. A koti is similar to a jacket, which can be created with or without sleeves. 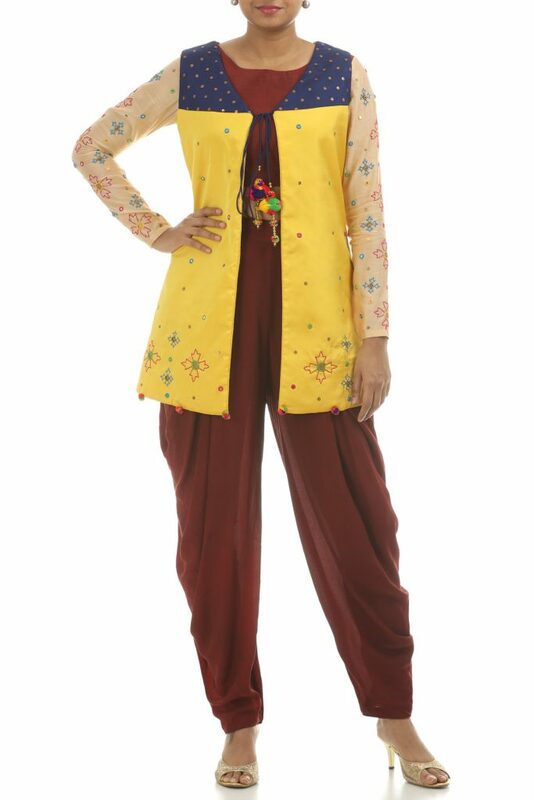 Today, the koti jacket style is a popular choice among salwar suits. This mustard yellow jacket, created with chanderi & cotton fabrics is a beautiful alternative for salwar suits. Be it a cultural event or a traditional ceremony, you can wear this outfit with dhoti pants and a crop top for a flawless look! Love these designs? There are many more you can explore. Don’t miss to check them out at our salwar suits sections today!